Expros combine an Explorer tip and a Probe tip into one easy-to-use double-end instrument. All Nordent Expro tips are made from springtempered stainless steel and machine ground to exacting tolerances. The millimeter measurements are precisely cut into the Probe tips. Colorcoding is applied to probes under extreme temperatures so that the color penetrates the surface of the tip. Probe tips undergo additional tighttolerance grinding to achieve the desired readability for each marking. Explorers are hand-sharpened to a point. All tips are then formed by hand into their final shape by expert craftsmen. W-23 Non-Color-Coded Williams Probe 1-2-3-5-7-8-9-10 mm markings with #23 Shepherd’s Hook Explorer. OW-23 Color-Coded Williams Probe 1-2-3-5-7-8-9-10 mm markings with #23 Shepherd’s Hook Explorer. 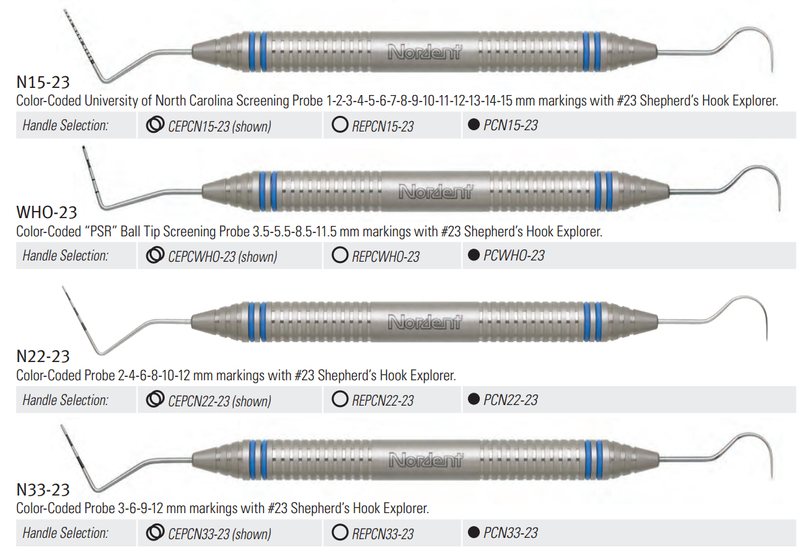 N12-23 Color-Coded University of North Carolina Screening Probe 1-2-3-4-5-6-7-8-9-10-11-12 mm markings with #23 Shepherd’s Hook Explorer. N15-23 Color-Coded University of North Carolina Screening Probe 1-2-3-4-5-6-7-8-9-10-11-12-13-14-15 mm markings with #23 Shepherd’s Hook Explorer. 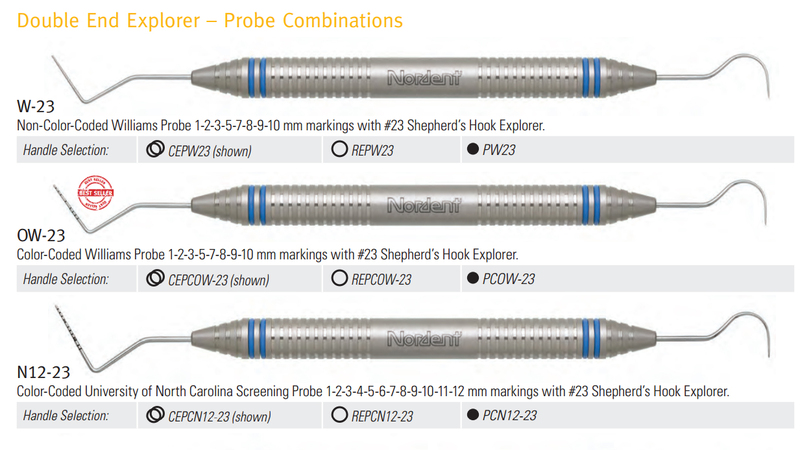 WHO-23 Color-Coded “PSR” Ball Tip Screening Probe 3.5-5.5-8.5-11.5 mm markings with #23 Shepherd’s Hook Explorer. N22-23 Color-Coded Probe 2-4-6-8-10-12 mm markings with #23 Shepherd’s Hook Explorer. N33-23 Color-Coded Probe 3-6-9-12 mm markings with #23 Shepherd’s Hook Explorer.